Investigators at the Medical University of South Carolina (MUSC) have recently identified unique functional oncogene signatures in four different human breast cancer cell types. The new study—“Functional oncogene signatures guide rationally designed combination therapies to synergistically induce breast cancer cell death”—which was published recently in Oncotarget may soon aid physicians in developing drug treatments for breast cancer patients based on the unique genetic autograph of their tumor. 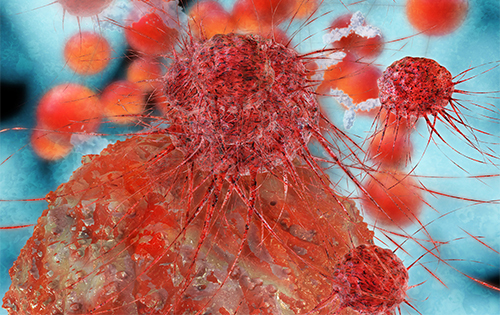 Due to the heterogeneity of cell types for breast cancer patients, many tumors respond differently to the same treatment depending on which oncogenes are active and which are just along for the ride. Identifying the panel of active genes in a patient's tumor—called the functional oncogene signature—could help oncologists select therapies that target its growth. The MUSC team used next-generation sequencing and genome silencing techniques as each cancer cell type grew and multiplied to assemble a list of genes for each cell type's functional oncogene signature, i.e., those genes that were copy number amplified or point mutated, and most essential to cancer cell survival. Although thousands of candidate oncogenes were screened during experimentation, only a handful made the list—fewer than 20 for each cell type. The generation of a list of genes deemed essential for tumor survival facilitated the selection of the best oncogene for pharmaceutical targeting. Since lower doses of targeted drugs can be highly effective, side effects could be reduced. For example, the researchers found that targeting two or more members of a signature with much lower total drug concentrations in combination still killed cancer cells better than one higher-concentration drug alone. Surprisingly, a BCL2L1-targeted drug that worked in one cell line also then worked in a fifth breast cancer cell line with a similar oncogene signature containing BCL2L1, an oncogene not normally associated with breast cancer. This work demonstrates that one signature-targeting treatment can be extended to more than one cancer cell type. This means that patients with other types of cancer who have a similar functional oncogene signature might benefit from drugs that target BCL2L1, which are already in development. The researchers believe that oncogenes identified in a tumor biopsy might one day soon provide a rational and individualized approach to pharmaceutical treatment with targeted drug combinations. Moreover, these new results could provide a rationale for redesigning clinical trials for breast cancer.